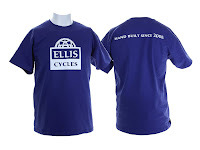 Ellis Cycles: T-shirts are here!! 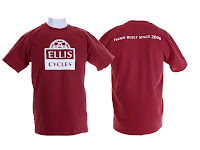 The Ellis t-shirts are finished. I was nervous about the colors, the samples on Gildan's web page are not the most helpful, but I'm really happy with my choices. The top is Cedar Red, and the bottom Metro Blue. Anyone who's interested in one they are $20 including shipping in the continental US. I'll also be offering them at the Cirque de Cyclisme in Virginia in a couple of weeks. $15 at the show. I just got done making hotel reservations for the weekend of Cirque, and I'm trying to figure out what other things I need to get done before then. Have to get a sign or banner made with the logo. Also want to print a bunch of old lug photos for an album of cool lug designs I've done up till now. Got the old Honda tuned up and it's ready to do the 12 hour haul to VA. It's actually running as well as it ever has, I've been getting about 38 mph lately. Sweet! Now I just have to figure out how to pack all the crap I'm bringing in there.